If your Heating element leaks (specifically written for the Duetto brew boiler)? This procedure is specifically for the Izzo Alex Duetto, but is actually applicable to most coffee machines with a screw in element on coarse threads. The number of turns of Hawk special fibre and PTFE tape may not of course be exactly the same as the pitch and depth of threads could vary. That said, the advice given for number of turns is likely to be in the general ballpark. The earlier models of Duetto and perhaps even the current ones, have a teflon gasket at the bottom of the brew boiler. If it's not leaking great (strangely enough the steam boiler element never seems to leak? ), leave it alone. 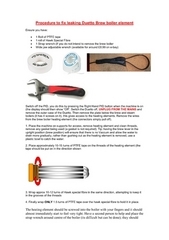 If it does leak, I have found it's better to not use a gasket and use the procedure in the attached .pdf file. I also think this may be the case for heating element gasket replacement in general. It's quite common for most espresso machines to leak a little at these points after a few years (you just tend not to notice it as the water evaporates) and when you do want to take the heating element out, it feels like the Gremlins have come and welded it in. They can be extremely hard to remove after a few years. The element will come out VERY easily, no matter how many years have passed. Does this affect the latest Duettos….I don't know, what I do know is, I am unlikely to ever use a Gasket on a heating element again. Note: Hawk Special fibre is hydrophilic and is an essential ingredient to success! Note2: I recently had to re-repair a heating element leak repaired using this method, it lasted for about 2.5 years and proved quite difficult to repair this way. I eventually settled on a much easier method. There is a very thin rubber gasket used on central heating pumps in the UK, go to a plumbers merchant, find one that fits around the threads (it can be quite a tight fit, so stretch it over that's OK). Lubricate each side of the gasket with a bit of Dow Corning Molycote 111 (or any silicone grease that's food safe). This will prevent the gasket tearing and improve sealing. Tighten the heating element only just enough to snug it up and prevent leaks….DON'T overtighten and only use 1 gasket, don't betempted to use 2. The machine I repaired using this method has remained leak free for 6 months.